Located on the 1850 Robinson-Huron Treaty territory, Laurentian University recognizes that we are on the traditional lands of the Atikameksheng Anishnawbek and Wahnapitae First Nations. Laurentian is committed to strengthening the foundation of knowledge in higher education and research to offer an outstanding university experience in English and French with a comprehensive approach to Indigenous education. Together with its federated partners, Laurentian University prepares leaders who bring innovative and intelligent solutions to local and global issues. Laurentian University is a microcosm of Canada: we are northern; we are bilingual; we are committed to reconciliation. Canadians are known for our diversity as we promote inclusion, civility, and respect. Our best solutions are collaborative ones. We are rich in natural resources. We are stewards of vast landscapes and beautiful environments. Our health care is the envy of many. While some have declared, “The world needs more Canada,” we are convinced the world needs more Laurentian. Laurentian University has particular strengths that position us to create knowledge, undertake fundamental research, and make significant contributions to crucial issues facing society. 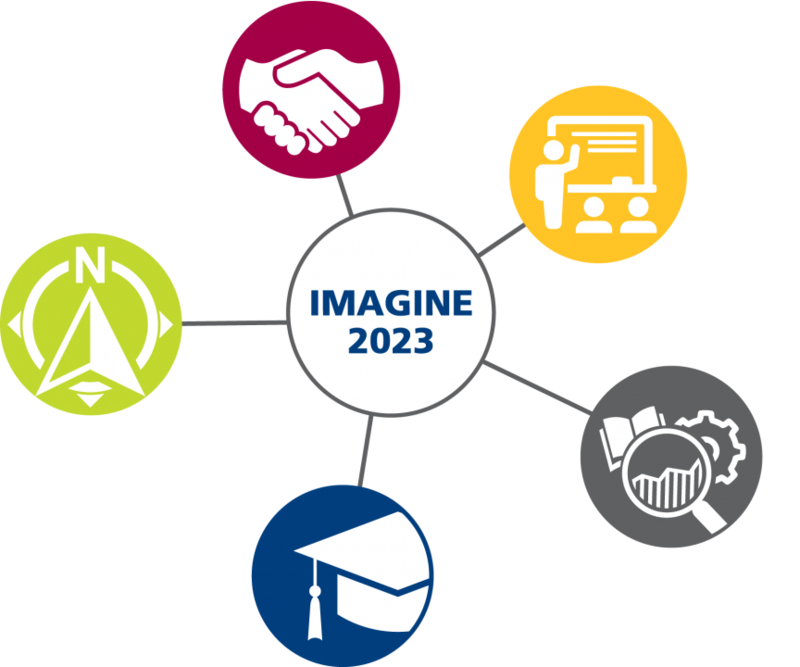 As we imagine 2023, Laurentian University will seek out opportunities for collaborations, investments, and accomplishments that align with the following strengths. Laurentian University will be a leader in the process of reconciliation through transformative postsecondary education and research. First Nations, Métis and Inuit students find a home away from home at Laurentian University where they excel in all faculties. With campus Elders and more than 25 full-time Indigenous faculty members in various disciplines, departments, and faculties, more Indigenous colleagues are teaching at Laurentian University than any other university in Ontario. The Indigenous Sharing and Learning Centre (ISLC), which opened on National Aboriginal Day 2017, features the spectacular round-room, inspired by the wigwam, with four entry points facing each of the cardinal directions, and provides state-of-the-art facilities in a variety of spaces, indoors and outdoors. The School of Indigenous Relations is equipping students as leaders to work more effectively with communities by learning about Indigenous worldviews, traditional teachings, theories, and practices. Students will find those crucial perspectives integrated into the curriculum across the faculties at Laurentian University ensuring that all Laurentian students gain a deeper understanding and appreciation of Indigenous peoples, their knowledges and histories, and their relationships to Canadian society. Laurentian University’s Maamwizing Indigenous Research Institute is emerging as a key site for advancing research on these topics. The Franco‐Ontarian flag proudly flies on our campus, where it was first created. Laurentian offers outstanding opportunities for Francophones to study in French and for immersion students to continue their studies in French or in bilingual programs. French language thrives here where programs, (including those in the École des sciences de l’éducation, the École d’orthophonie, the Département d’études françaises), and research and advocacy work conducted through the Institut franco‐ontarien (IFO) are all housed in the recently renovated Alphonse Raymond Building. Through the École de service social and Laurentian Online, we are the only university in Canada to offer the online Bachelor of Social Work in French. The Northern Ontario regional section of the Association francophone pour le savoir (ACFAS‐Sudbury), is based at Laurentian University. Teachers, who are vital to the future of French language, are educated here by award‐winning colleagues. Our students, staff and faculty benefit from opportunities for meaningful engagements in a bilingual milieu. The flexible Bachelor of Arts degree structure allows students to combine modules from Arts, Science and Business Administration while studying in both English and French. With a vibrant presence in Greater Sudbury’s downtown, a studio‐based model of instruction, and inspired by the significant contributions of Indigenous and northern collaborators, the McEwen School of Architecture proposes sustainable built‐environment solutions that respond to community needs. Our forensic science programs, the first in Canada to be accredited, now include the Bachelor of Forensic Identification (BFI) degree ‐ the only degree of its kind in Canada that brings together crime scene investigators with forensic scientists across disciplines. We offer North America’s only comprehensive Science Communication program with both a graduate diploma and a Master’s program. Our interdisciplinary graduate programs, including the MA in Humanities, the PhD in Biomolecular Science, the PhD in Human Studies and the PhD in Rural and Northern Health, are prime sites of collaboration across disciplines, faculties, languages, and cultures. Students in the Master’s in Interdisciplinary Health program have the option to work toward either an MA or an MSc degree. The Cliff Fielding Research Innovation and Engineering Building fosters a culture of collaboration with maker spaces that are shared across the faculties. Building on the Nobel Prize‐winning international collaborations of the SNO experiment, we foster world‐leading research in particle astrophysics at SNOLAB while providing job opportunities for students in multiple disciplines. Laurentian University’s expertise in mining and environmental stewardship will drive knowledge creation, economic prosperity, and ecological sustainability, locally, nationally, and internationally. Our campus, surrounded by hundreds of lakes, is near to many of the world’s largest mineral deposits and a variety of complex ecosystems. Our commitment to excellence in all aspects of environmental studies and mineral resource research and education includes advancing critically important relationships with Indigenous peoples. Our world‐class faculty, (with the Goodman School of Mines, the Harquail School of Earth Sciences, and the Bharti School of Engineering), collaborate through our internationally recognized research centres, and partner with global industry leaders. Students in mining‐related programs at Laurentian receive the highest calibre training in the scientific, technical and socio‐economic aspects of the industry because Laurentian offers a comprehensive approach to the entire mining life cycle. At the same time, Laurentian University has a deep, long‐standing commitment to the environment. Decades of world‐class scholarship on industrial contamination and the recovery of lands, lakes and communities have given the “Sudbury story” global resonance. Laurentian University’s School of the Environment builds on this reputation with undergraduate programs leading either to a B.A. or a B.Sc. degree. Research facilities including the Vale Living with Lakes Centre and its Fresh Water Ecology Coop Unit present students in the M.Sc. in Biology and the Ph.D. in Boreal Ecology with unmatched opportunities to study environmental issues right at our doorstep. Laurentian University will provide innovative solutions to address particular health concerns and the general well‐being of the North and its populations. We equip highly qualified personnel who study in English and in French, and with Indigenous communities. Our Nursing programs benefit from a state of‐the‐art clinical learning lab and many collaborative partnerships. We have the only Midwifery program in French in Canada outside of Québec and the second largest Speech‐Language Pathology program in Canada. The presence of the Northern Ontario School of Medicine (NOSM) at Laurentian creates numerous opportunities for research and program collaboration. Laurentian University’s Centre for Rural and Northern Health Research (CRaNHR) and our Centre for Research in Occupational Safety and Health (CROSH) are leaders in academic and applied health research. Colleagues in the Indigenous Social Work Program and the School of Social Work contribute to improving the general well‐being of individuals, groups, communities and society. Laurentian researchers and professors from the Faculty of Arts (specifically in Sociology and Psychology), the Faculty of Health, NOSM, and the Health Sciences North Research Institute (HSNRI) are designing and implementing initiatives that advance knowledge and meet the needs of rural, northern and Indigenous peoples. We celebrate our location in Greater Sudbury because northeastern Ontario provides us with unique opportunities in an unmatched setting. The North is our advantage. We focus on the student experience because we know that postsecondary education is transformational. We are creators, holders, and communicators of knowledge that connects the generations. Through critical inquiry we discover answers relevant to society. We pursue collaborations across campus and with local, provincial, national, and international partners because relationships empower us. As we imagine 2023, Laurentian University will act on its shared values, build on its strengths, and achieve these outcomes.